Youth participation is something that I have always been passionate about. I’ve always admired how Jigsaw encouraged young people to get involved and take the lead when needed. When we look back at 2015, we will remember it as the most significant year in our short history. Jigsaw was written into the HSE National Service plan, a clear commitment recognising the value of our services and work in early intervention to support the mental health of Ireland’s young people. Since we were founded in 2006, originally under the name of Headstrong, we’ve continued to grow and develop what we do with the aim of being able to support all young people across Ireland with their mental health. We’ve often had to be nimble and creative in our approach, but nothing beats knowing we have a solid foundation to plan for the future and this security fosters an even deeper level of creativity. The faith that our colleagues in the HSE place in us means a lot – they see the value of Jigsaw and understand that it answers an important need for young people aged 12-25. They know that adolescence is an exquisitely vulnerable time in the lifespan - a time when mental health particularly is on the line and if neglected can take our young people down some very dark roads. Jigsaw makes sense on so many levels – it’s a community response, it provides a safe place where young people can be heard without being judged. Where their hard, painful experiences find expression and where they learn that first valuable lesson – that people who seek help, enjoy better mental health. They also often meet their One Good Adult® through our Jigsaw Service and that provides a valuable template, one that can last a life time. Our My World Survey research clearly demonstrated that having One Good Adult® is the single most protective factor to a young person’s mental health. We know that the support in a Jigsaw Hub is vital but we ‘get’ that everyone across a community from families, schools, youth and community services want to build confidence and competence to be there for ‘our’ young people. We also know that the soft tissue work that radiates out from the Hub is just as vital in our 10 communities as the numbers of young people who use our service and recommend it to their friends. Jigsaw works because it’s a collaborative response to an ever changing landscape. It helps that we use a state of the art data capture system so that we constantly sharpen the saw and keep our finger on the pulse of the ‘lived experience’ of young people in Ireland. To date, we have worked with more than 15,000 young people and families. For the first time we now have a constituency of people who have used Jigsaw and gone on to flourish and direct their energies towards what they really want to do with their lives. Experiences which found appropriate support in Jigsaw and their communities mean that these people have not been limited or labelled by a mental health vulnerability. If anything, they are more ‘alive’ and they support us in our work by referring the next generation into our service. Word of mouth has always mattered to us. The kind word of someone who has been through a storm and can help avert suffering for another proves the lasting impact of our work. Without our Youth Advisory Panels, staff and board this wouldn’t happen. And it all combines to give our work a vitality and creative edge. Thank you for joining us in our mission of changing how Ireland thinks about young people’s mental health through our Jigsaw programme of research, engagement, and services. It means the world. 2015 was a significant year in the growth of Jigsaw. Being mainstreamed and itemised in the HSE National Service Plan put our Jigsaw service on firmer ground. In Jigsaw all our work falls into three strategic areas: Research, Engagement, and Services. Through our Jigsaw Services around the country, we provide an early intervention mental health service developed by Jigsaw for young people aged 12-25. We deliver this in close collaboration with young people, statutory, voluntary and community mental health and related services. We were heartened by the extra allocation of funding to deliver three new Jigsaw Services in Dublin City, Cork City, and Limerick during 2015. Planning has begun for these new projects which will bring our Jigsaw communities from 10 to 12. The body of this annual report outlines the progress made during 2015. The role of the Jigsaw Board is to oversee all this work. The Board is committed to the highest standards of governance and Jigsaw is in full compliance with the Governance Code for Community and Voluntary Organisations. The third International Association of Youth Mental Health Conference took place in Montréal and the delegation from Jigsaw did us proud. Among our team at Montréal were Aoife Price and Amelia Marley – members of the Jigsaw Youth Advisory Panel. They addressed the conference on our Jigsaw Service, which is shaped by young people for young people. This was one of the few presentations at the conference delivered by young people and evidenced how important youth participation is for us. Not many boards witness young people contributing and being heard. The Youth Advisors who sit with the Jigsaw Board play a real and vital role. Our Youth Learning Network in The National College of Ireland in July was very impressive. More than 80 young people from Jigsaw Youth Advisory Panels nationwide assembled for a day where they envisioned the future of Youth Mental Health in Ireland. For Jigsaw board members it’s gratifying to see that Ireland’s future is in the hands of those that care deeply and that are already taking action on youth mental health. In Jigsaw when we set out on this journey in 2006, we wanted to encourage kitchen conversations about mental health. Because we are powered by our Youth Advisory Panels, I believe in and I witness this happening and it fuels and underpins the ways in which we engage with communities across Ireland. Research is at the heart of what we do. It provides evidence from and for practice by helping us to understand what young people need, what works best and how we can improve. My fellow board members give freely of their time, skills and intelligence to guide our work. No member of the Jigsaw board joined by accident. All of our careers in different disciplines from the private and public sectors have proved time and again that getting in early makes sense, saves money and prevents more entrenched problems in the long- term. I want to pay special tribute to Sheelah Ryan who stepped down as Chair during 2015. She served us tirelessly and to great effect since 2011. We also said goodbye to Danuta Gray, Joe Horan and Ian Daly during 2015; each contributed enormously to what we have achieved. I also want to pay special tribute to Orla Kearns, who sadly passed away in January of this year. Orla was a respected member of our Youth Advisory Panel in Jigsaw Tallaght who began her tenure in 2013. She was held in extremely high regard by staff and fellow YAP members. Orla was described by those who worked with her as a person who brought a lot of creativity and ingenuity to Jigsaw Tallaght’s Youth Advisory Panel. Orla is missed greatly by the team at Jigsaw. 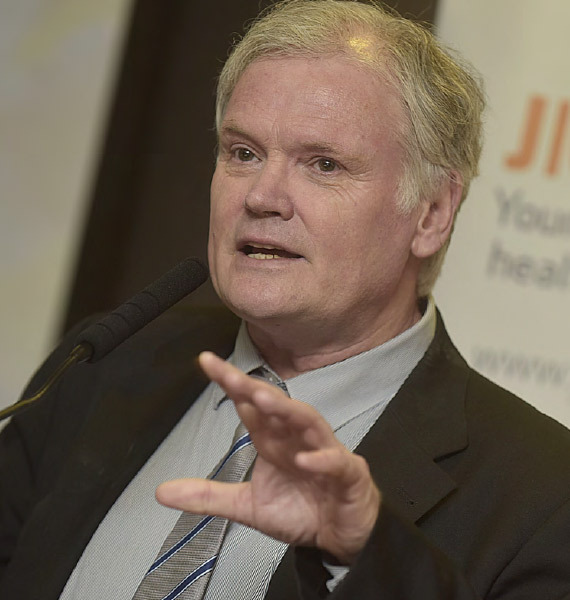 Everyone who’s part of the Jigsaw story – our staff, YAP members, funders, collaborators and supporters throughout the country – deserves that gratitude for being part of our vision of an Ireland where young people are connected to their community and have the resilience to face challenges to their mental health. Thank you for being part of this change. Jigsaw’s lifeblood is involving young people in the decisions and policy that impact on them, helping to shape and influence how Jigsaw works in communities across Ireland. Since Jigsaw was founded, back in 2006 as Headstrong, the Youth Advisory Panel has been there to act as the compass to help direct the creation and delivery of what Jigsaw does. Our involvement has grown along with the organisation. Jigsaw’s lifeblood is involving young people in the decisions and policy that impact on them, helping to shape and influence how Jigsaw works in communities across Ireland. Through being part of the Youth Advisory Panel, we’re able to provide vital insight and perspective on how we feel as young people and the kinds of support that we need. We help to ensure that Jigsaw engages with communities in a way that makes sense to them, and that our Jigsaw Services are a place that is warm, welcoming and safe for young people to get support for their youth mental health. 2015 in particular, has been a big year for the Youth Advisory Panel. This year, more than ever, young people in Jigsaw showed initiative, and demonstrated their influence and resilience in overcoming any challenges that presented along the way. The Youth Learning Network that took place in the National College of Ireland on the 21st of July shows the essential creativity and energy that the Youth Advisory Panel bring to Jigsaw. While young people have always been involved in organising this annual event, 2015 epitomized youth leadership and participation. It was a day which provided a platform for young people to be heard, and the insight and knowledge reflected on the day gave reassurance that the future of mental health in Ireland is in safe hands. Another highlight of the year was the opportunity to visit the McGill Summer School - a national platform where a wide range of topics were covered with regards to mental health. Both interesting and informative, it shows how mental health is beginning to find its rightful place at the forefront of the political agenda. It was very beneficial for us as young people to see the high attendance against the backdrop of a changing rural Ireland, and it offered a bird’s eye view into the current mental health landscape. It was a day of learning from the past and looking towards the future, complimented by 99’s under the glistening Glenties’ sunshine! Headstogether was also one of the proudest moments for the Youth Advisory Panel. A fine example of our active involvement in helping to develop a programme of support for schools to promote help-seeking for substance misuse and mental health issues. Through consultations and feedback at every point of development, we had a great sense of ownership and pride in the creation and delivery of the project. 2015 has included handing out green ribbons, writing blog posts, social media campaigns, engaging with the staff and board of Jigsaw and conveying a positive message to young people across the country, encapsulating the primary mission of the Youth Advisory Panel. Heading into the future with new members on board, fuelled with passion and energy, we are ready to lead Ireland on her journey in promoting positive mental health in the hearts and minds of communities across Ireland. Jigsaw – The National Centre for Youth Mental Health, is a charitable organisation supporting young people’s mental health in Ireland. Through Research we understand the challenges facing young people and use this to improve youth mental health services. Through Engagement we change the conversation about mental health from one of stigma and mental illness to one of openness and resilience. Through Services we support young people to achieve better mental health and wellbeing. In 2016, the year of our tenth anniversary, we changed our name from Headstrong to Jigsaw. This was in recognition of the incredible efforts of our supporters, staff and Youth Advisory Panels in making the name of our service ‘the word’ in the national conversation about youth mental health. We know that Jigsaw works. Working together under the one name, we aim to set the course for a future where every community across Ireland will have access to the support that Jigsaw offers – We are Jigsaw. An Ireland where young people are connected to their community and have the resilience to face challenges to their mental health. Changing how Ireland thinks about young people's mental health through the Jigsaw programme of Service development, Research and Engagement. We respect the voices of young people and believe that all young people should be given the supports to develop good mental health. We recognise that young people, communities and Government all have a role in and responsibility for developing a supportive environment that fosters mental health in young people. We seek to innovate, challenge & apply best-practice in youth mental health in an Irish context. We are an evidence-led organisation, continually researching, evaluating and improving our work.